Vehicles under six months after refistration date or mileage under 1,000 KM with thia guarantee logo will be granted international warranty if six months from RamaDBK which ever comes first. 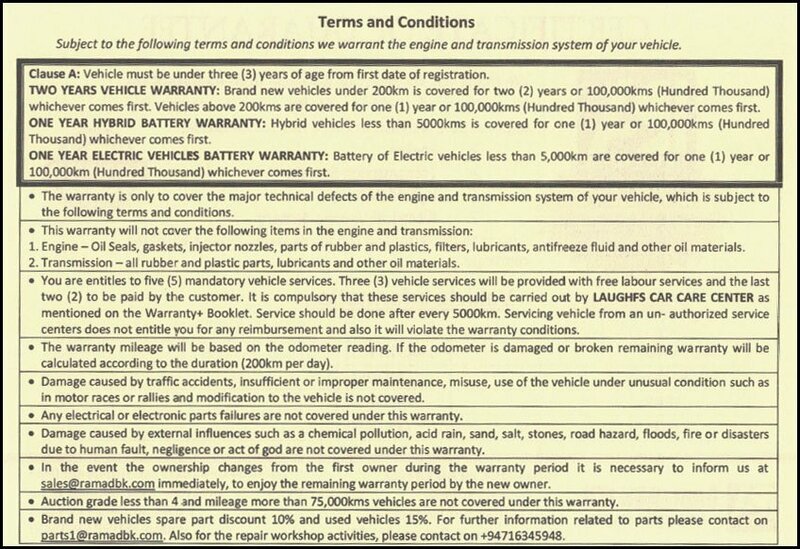 We thank you for selecting a vehicle from us, as a responsible organization, we wish to warrant the engine and transmission system of your vehicle for a period of One year or 1,00,000 km subject to the following terms and conditions. Clause A: Vehicles under one years of age after first registration date. This warranty is only to cover the major technical defects of the engine and transmission system of your vehicle. Engine - oil seals, gaskets, injector nozzles, parts of rubber and plastics, filters, lubricants, antifreeze fluid and other oil materials. Transmission - all rubber and plastics parts, lubricants and other oil materials. You are given 3 labor free services, and it is compulsory to get these from our authorized service center. The regular after sales care for your vehicle, from our service center will help you to enjoy the uninterrupted warranty coverage. The warranty mileage will be based on the odometer reading. If the odometer is damaged or broken remaining warranty will be calculated according to time (200 km per day). Damage caused by traffic accidents, insufficient or improper maintenance, misuse, use of the vehicle under unusual conditions such as in motor races or rallies, and modification to the vehicle is not covered under this warranty. Any electrical or electronic parts and failures are not covered under this warranty. Damage caused by external influences such as chemical pollution, acid rain, sand, salt, stones, road hazards, Floods, fire or disasters whether due to human fault, negligence or act of god, are not covered under this warranty. In the event the ownership changers from the first owner during the warranty period it is necessary to inform us immediately, to enjoy the remaining warranty period by the new owner. The warranty period is 12 (Twelve) months or 1,00,000 Km (Hundred Thousand) whichever comes first. Clause B: Vehicles under two years of age after first registration date. Vehicles under two years after registration date will undergo for spare parts discount warranty. Havelock Town 252, Havelock Road,Colombo 05. Kohuwala 24, Sunethradevi Mw, Kohuwala. Koswatta 260H, Kaduwela Road, Koswatta, Battaramulla. 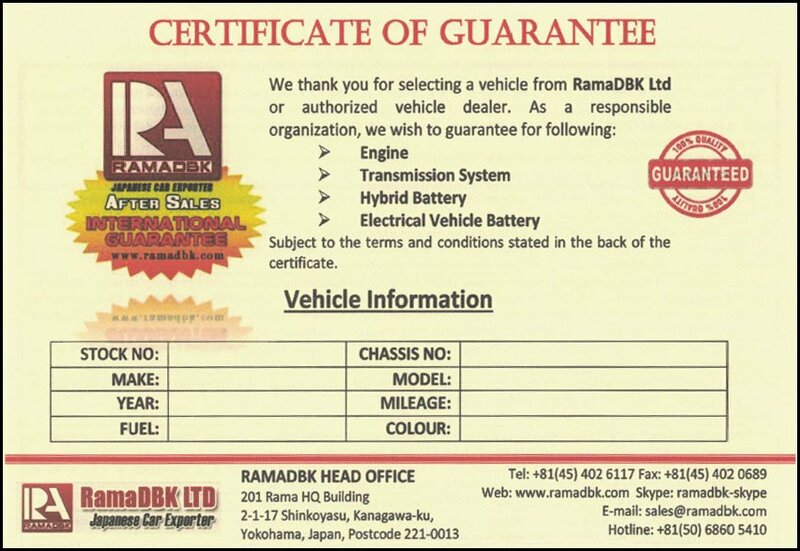 Service record book offered by RAMA D.B.K Limited along with the LUGFS CAR CARE coupon book must be presented at every time to LAUGFS Car Care service center to redeem respective offers. This offer is NOT VALID for commercial vehicles. Offer card is valid for two years from the date of Purchase of Motor vehicle. When your vehicle is serviced, all car care products, Lubricants, Filters & other accessories should be purchased form LAUGFS Car Care Service Centers only. Please make advanced appointment with LAUGFS CAR CARE to avoid disappointments. Offer coupons have no monetary value. Tempered coupons are not valid. Offers are valid only for labour charge.